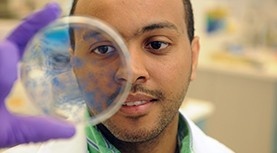 The Microbiology and Immunology graduate program provides you with the foundation to excel in a competitive research environment. As a graduate student in our MSc and PhD programs, you will focus primarily on research. You will have the opportunity to aggressively pursue an independent research project, which will provide the foundation for your graduate thesis. Along with gaining a general knowledge of microbiology and immunology, we also have four areas of specialization so you can concentrate your studies in specific areas.